Hazard Communication is an OSHA mandated training program for employees who may be exposed to hazardous chemicals in the workplace. 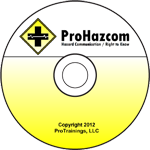 This DVD training may be used as an alternative to the ProHazcom.com online training course or in conjunction with the online course by showing the DVD to the group and having employees complete the exam individually online. By completing the online portion, employers will be able to more easily track staff compliance and receive training renewal reminders. Employees will also receive weekly refresher videos to help keep their knowledge of hazard communication top of mind.